Jan. 12-13: SkillsUSA Scoring Boot Camp, Leesburg, Va. It is still early, but three state SkillsUSA directors have already led their states to surpass last year’s total membership. We are also seeing very positive numbers from many other states. I am confident, because of the outstanding work in the states, that this year will be the best in history and that our numbers will continue to trend upward. With our SkillsUSA Career Essentials suite of curriculum and assessments, new regional support, new partnerships and new board-driven strategic imperatives that are positioning the organization to grow, we are in our 16th straight year of membership increases. The number of lives changed for the better is the most important factor as we deliver on our mission. The state directors with record membership are: Victor Nieves, Puerto Rico; Josh Klemp, Rhode Island; and Anton Doos, U.S. Virgin Islands. I recently attended a by-invitation-only meeting at the U.S. Department of Education with 12 leaders from China’s State and Providential Education System and top U.S. experts in career and technical education. The Chinese delegation requested the meeting to further research and compare our training systems. It was a great opportunity to learn and discuss cooperative efforts between the two countries, since we are influenced by each other in education philosophy, policy, management, teacher education and curriculum. Leading the meeting, where we also discussed the challenges and innovation in China’s vocational education and training system, were Secretary of Education Betsy DeVos; Scott Stump, assistant secretary for the Office of Career, Technical and Adult Education; and Maureen McLaughlin, senior advisor to the secretary and director of international affairs. Others speaking for the United States included representatives from the Council of Chief State School Officers; the Association for Career and Technical Education; and state CTE directors from Alaska, Wyoming and Iowa. Officials also participated from the Office of Career, Technical and Adult Education at the U.S. Department of Education; Northern Virginia Community College; and JPMorgan Chase & Co. I was able to spend quality time with our new assistant secretary (Scott Stump is a former SkillsUSA board member), several state CTE directors and community college leaders. At a Manufacturers Alliance for Productivity and Innovation (MAPI) board of trustees meeting, our new SkillsUSA Foundation chair, Maureen Tholen of 3M, and I led a CEO roundtable discussion on the role of manufacturers in career and technical education. The meeting was held at the Madison Hotel in Washington, D.C.
Maureen presented the business case for involvement with SkillsUSA from 3M’s perspective. She did an amazing job showing alignment of SkillsUSA with the various business units at 3M and was able to demonstrate the return on investment that 3M receives from our partnership. Because of the meeting, we have already received interest from Ingersoll Rand and the Siemens Foundation. I expect several new partnership opportunities from the networking opportunity with some of the nation’s top manufacturing executives. The MAPI board is made up of CEOs of leading U.S. manufacturing companies and includes SkillsUSA supporter Nick Pinchuk from Snap-on. The mission of MAPI, a nonprofit professional society supporting manufacturing leaders, is to help them make smarter business decisions through programs, professional development events, and manufacturing-focused business insights and research. At the SkillsUSA Maryland Fall Leadership Conference in Ocean City, Md., I presented on the SkillsUSA Framework and how it supports strong chapter development, as well as how our Chapter Excellence Program engages students and teachers. There were about 500 attendees at the event. 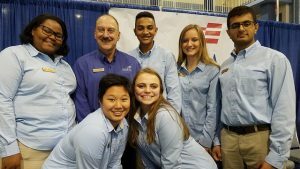 Their fall leadership conference theme was “Filtering the Framework,” representing both the SkillsUSA Framework and their mission to promote a healthy Chesapeake Bay. Maryland has the world’s largest man-made oyster reef, and oysters are an important component of the living ecosystem of the Chesapeake Bay and its tributaries, helping to clean it through their filtering. Big thanks go to board member and SkillsUSA Maryland director Chuck Wallace and his student leadership team for inviting me to this exciting event. I attended the NCCER board of trustees meeting in Gainesville, Fla. The first evening began with an informational tour of the Rinker School of Construction Management at the University of Florida. Students demonstrated some amazing new construction technology for the group. From design to complete build, the use of drone technology, virtual reality scanning and project walk-through and even viewing full building designs through hologram projection, the campus showcased the latest techniques used in commercial and industrial construction. The next day, the NCCER board meeting focused on current research on skills gap solutions, new social media initiatives and curricula and certifications. SkillsUSA is cited in their latest longitudinal study research report, “Restoring the Dignity of Work.” You can see the report here: www.nccer.org/research. SkillsUSA was showcased several times at the meeting, as a key part of the NCCER research and through glowing testimonies from board members who attended our national conference for their first time in 2018. CEO Don Whyte has announced his retirement, and I was very pleased to see Boyd Worsham, one of our best national technical committee chairs, announced as the new NCCER president. I traveled to Denver to participate and speak at an incredible fundraising gala for SkillsUSA Colorado. 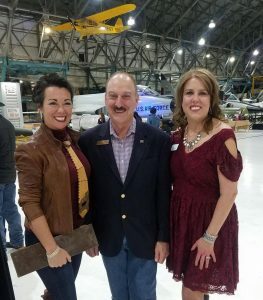 Julie Wright and her team managed an outstanding event, held at a military aircraft museum called “Wings Over the Rockies.” Tables were $1,000 each, and about 250 business and education partners attended. Toyota was the underwriting partner. Other national partners were there including the Associated General Contractors, Cummins and Universal Technical Institute. Several live games and activities were held during and after dinner to raise additional funds. State officers recited our creed, and Kayleen McCabe gave the keynote. I was pleased to have quality time with instructors and administrators, including those from our three 2018 Colorado Models of Excellence chapters. I enjoyed spending some time with state CTE director and board member Sarah Heath. And, I was thrilled to see my 1988 state president, who is now living in Colorado and is serving as one of Julie’s volunteers. Big congrats to Julie and her team for a highly successful and well executed event. After leaving snow in Denver, I traveled to Fort Lauderdale, Fla., to the ASE board of director’s meeting. ASE president and CEO Tim Zilke, also a SkillsUSA Foundation member, and his staff led a good meeting. The ASE Foundation has started the process for a new strategic plan focused on marketing, communication and recruitment and increasing the number of certifications by students and master technicians. We received progress reports of all aspects of the organization and heard the latest automotive industry trends, particularly around encouraging more recruitment of young people into the trade. The board is made up of manufacturers and aftermarket organizations, all industry leaders. It was great to see our friends from Toyota there and good to see that Ford is now back with a representative on the board. These strategic roles help SkillsUSA stay on top of each industry we represent. On Nov. 15, I traveled to Navajo Technical University in New Mexico. I was invited to visit the school by our college/postsecondary national officer Lorena Giesbrecht. The Navajo Nation spans four states, and it was an incredible opportunity to see the inner workings of this unique college and meet with the faculty and administration. Despite the economic challenges faced in this relatively remote area of New Mexico, this campus and chapter are doing great things. Lorena and the chapter officer team were wonderful hosts. I toured nearly all the training programs, saw some high-tech learning and even put on a helmet to refresh my memory of my welding skills. The chapter meets weekly and SkillsUSA is a real focus for the students. Our SkillsUSA membership materials and our magazine were in every lab and classroom. I spent the day on campus and had lunch with the culinary students and our former WorldSkills expert Bob Witte. On Nov. 5-8, we hosted a group of state SkillsUSA directors here at the National Leadership Center for educational training. State directors networked and collaborated on a variety of topics ranging from state-level communication best practices, fall leadership conferences, state officer programs and SkillsUSA Career Essentials, as well as the Chapter Excellence program, Metrics and Attributes, and visioning for future success. That’s it for now. Thanks for all you do for the great students and teachers we serve. Starting with the 2019 National Leadership and Skills Conference (NLSC), SkillsUSA’s board of directors has approved a $15 increase in the registration fee to make NLSC more cost-neutral for the organization. This year only, as a result of a majority vote at the state SkillsUSA director meeting, there will be an additional $5 added per person to cover the cost of a $5 preloaded ticket for Champions Night at the Bats Stadium. The $5 can be used for a concession purchase or in the gift shop. In 2019, the new registration fee will be $170 per person, and in 2020, the registration fee will drop back to $165. This year, SkillsUSA TECHSPO will also have an increase for exhibit space. There will be a 10 percent increase for nonpartners and a 20 percent increase for partners. The fee increases are due to the higher cost of doing business in many categories. SkillsUSA’s goal is to have conference registration cover the actual cost of holding the event. If you have questions about conference or TECHSPO registration fees, email Shelly Coates at scoates@skillsusa.org. The new year is just around the corner, and for SkillsUSA Store staff, it means out with the old and in with the new for 2019. The SkillsUSA Store is excitedly preparing to launch the highly anticipated and newly redesigned SkillsUSA blazers. The store elves are busy making room, opening boxes, stocking shelves and updating the website for a new year launch of the new blazers at www.SkillsUSAStore.org. With a new lower price point of $99, bulk buy discounts as low as $79 and upgraded features, you can update your closet and outfit your students less expensively for competitions throughout the new year. The entire SkillsUSA Store team wishes you and yours a healthy and happy holiday season. Make the SkillsUSA Store your first stop in the new year! Interested in Becoming a Mentor to a New State SkillsUSA Director? State SkillsUSA directors: Are you interested in using your experience as a state SkillsUSA director to help someone else? Have you ever considered serving as a mentor to a new state director? Now is the time to explore the possibilities in serving as a mentor by completing a quick application. Applicants will be sent a mentor guide to prepare them to serve and then will be notified when there is a new state director. To complete an application, go to: www.surveymonkey.com/r/SDmentor. If you have questions or need additional information, contact Gayle Silvey at gsilvey@skillsusa.org. Don’t forget that you can support SkillsUSA when you do your holiday shopping through Amazon. Make your order through AmazonSmile and search for ”SkillsUSA Foundation” as your charity of choice. You can also click on this link. SkillsUSA will receive a percentage of the sale and you will not incur any additional cost. SkillsUSA is a certifying organization of the President’s Volunteer Service Award, allowing advisors, student members and registered alumni to earn recognition for community service activities and time spent volunteering. This award is a presidential honor that recognizes the valuable contributions of volunteers across the country who are answering a national call to serve others through their current activities or lifetime efforts. As a certifying organization, SkillsUSA can identify eligible recipients, verify their service hours and distribute the award to outstanding volunteers. Given participation in ongoing service activities, advisors and students may already meet the requirements to receive the award. To qualify, SkillsUSA members, advisors or alumni can submit a record of their service hours. For details on qualifying hours and requirements for submission, visit: www.skillsusa.org/membership-resources/awards/presidents-volunteer-service-award. Applications must be received by March 29. Is there an amazing SkillsUSA advisor who truly makes a difference in his or her classroom, school and within your state association? Applications are being accepted for the 2018-19 SkillsUSA National Advisor of the Year program. 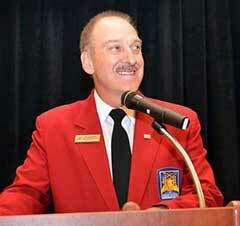 This is SkillsUSA’s highest teacher honor and one of the most exciting announcements at the national conference. Each state association is asked to gather advisor applications and select a SkillsUSA Advisor of the Year for the state. An application must be completed for state winners, and each state may submit a high-school and a college/postsecondary applicant. The application is located on the password-protected website for state SkillsUSA directors. All applications must be completed and submitted to Jeri Widdowson at skillsusapennsylvania@comcast.net by Dec. 3. Nominations will be grouped by region and reviewed by a state director committee to determine the five regional Advisors of the Year. The five regional winners will be invited to attend the 2019 SkillsUSA National Leadership and Skills Conference in Louisville, Ky. Following interviews, one national advisor of the year will be selected. All five advisors will be recognized on stage at the Opening Ceremony. If you have questions, call or email Jeri Widdowson at 814-238-0380 or skillsusapennsylvania@comcast.net. You can also email Taryn Zeigler at tzeigler@skillsusa.org. State SkillsUSA directors: SkillsUSA will be holding a Conference Management System “boot camp” with programmer Mark Williams on Jan. 12-13 in Leesburg, Va. The training is for state SkillsUSA directors and anyone who works with the state scoring system. The training will take place beginning at noon on Jan. 12 (lunch included) and will end at noon on Jan. 13. Please plan your travel accordingly. SkillsUSA has reserved a room block at the Comfort Suites, 80 Prosperity Ave., Leesburg, Va. Meals and training will be provided by SkillsUSA. Attendees are expected to pay for travel and lodging. To reserve a room, call the Comfort Suites at 703-669-1650 and ask for one of the blocked rooms under SkillsUSA. There is a complimentary shuttle service to the hotel and back from Washington Dulles International Airport. If you have questions, contact Patty Duncan at 703-737-0635. SkillsUSA is seeking talented student or adult performers to sing the national anthem at the Opening Ceremony for the 2019 SkillsUSA National Leadership and Skills Conference. Audition videos can be submitted via: https://skillsusa.wufoo.com/forms/national-anthem-auditions/ and must be the singing of the national anthem. Auditions must be received by Feb. 4. SkillsUSA does not pay any travel expenses for the selected singer to attend the national conference. Questions may be directed to Heidi Walsh at 703-737-0615 or hwalsh@skillsusa.org. Feb. 5 is the deadline for entries to be received (not postmarked) for the SkillsUSA National Conference Pin and T-shirt Design Challenge. This event is open to all paid student members of SkillsUSA. This is a great way to have a student and advisor from your state recognized. Rules are posted on the SkillsUSA website at: www.skillsusa.org/competitions/pin-design-challenge/. Questions may be directed to Heidi Walsh at 703-737-0615 or hwalsh@skillsusa.org. CareerSafe sponsors a National Youth Safety Video Contest, in which students across the country are challenged to create a two-minute video demonstrating safety in the workplace. All submissions should be sent to CareerSafe by March 1. The winning students will receive a SkillsUSA prize pack as well as a scholarship up to $2,500, and the winning school will receive a prize up to $5,000. For more information, visit the CareerSafe website at: www.careersafeonline.com.